Many Galesburgers have heard of the second movie to be filmed in the city: ''Those Were the Days'' starred William Holden and was based on the George Fitch stories about Old Siwash. Filmed at Knox College and around town, it had its world premiere here in 1940. But there was an earlier film. In 1934, the Union Pacific and CB&Q introduced new, streamlined trains -- the M10000 and the Zephyr. Both were articulated diesels of three cars intended to put new style and excitement into Depression-era rail travel. Both were featured on national tours and at the Chicago World's Fair. Hollywood was entranced by the possibility of a movie featuring one of the pair. Coming up with a plot was another matter. After all, planes could fly from coast to coast in the time it took a train to go halfway. Glendon Allvine, a producer at RKO Radio Pictures, and Roger Whately, editor of the Diesel Digest, found the answer -- an emergency run with an iron lung from Chicago to Boulder Dam. The whole country was jittery about infantile paralysis, and Los Angeles itself had over one thousand cases. A script was hammered out by Whately and scenarist Jack O'Donnell which involved a love story, a German spy, and hair-raising exploits with a drawbridge, freight cars, and other railroad paraphernalia. The Burlington turned over the Zephyr the week after Labor Day, when it had finished its exhibition at the World's Fair. The Burlington logo on the front was repainted to read ''Silver Streak,'' and shooting began along the line. Actually, ''The Silver Streak'' was a 72-minute B-movie intended for the bottom half of double features or solo at cheaper theaters. The cast was headed by Charles Starrett, who would gain greater fame as the Durango Kid in a series of B-westerns for Columbia Pictures. Sally Blane was the love interest, ex-silent film star William Farnum her father, the railroad president. Comedy was provided by Arthur Lake (later Dagwood in the ''Blondie'' movies), Guinn Williams and Edgar Kennedy. It did have a lot of action, and the location shots of the Zephyr are an interesting record of this pioneer; but director Tommy Atkins falls back on under-cranking for many of the near mishaps with the train. (Under-cranking requires photographing action at a slower rate than usual so it appears speeded up -- and all too often jerky -- when projected as part of the movie.) Lake's comedy is limp, and Starrett and Blane have little chemistry together. Starrett handles fisticuffs far better than emoting. The black-and-white movie came and went without making much of a splash. It has survived, however, because of rail-fan interest in the Zephyr, and the movie is available on video tape. What's more, the screenplay was published with articles by Allvine, Whately, Budd and others by Haskell-Travers Publishing of Los Angeles in 1935 -- one of the first ever published. Budd's article is particularly interesting. For example, in detailing the Zephyr's design and history, he reports that diesel fuel for it cost from 3 to 4 cents a gallon; and the Zephyr could get 2 and 3/4 miles a gallon. Even in 1935, he was already moaning about the competition of automobiles. He claims even at that date, railways had already lost 80 percent of their passenger business. The Union Pacific eventually got into a movie of its own in 1939 when Cecil B. DeMille did a first class feature for Paramount about building the transcontinental railroad. One of the U.P. diesels is shown at the end; but wood-burning 4-4-0 locomotives are the real stars of the movie, which is set in the 1860s. 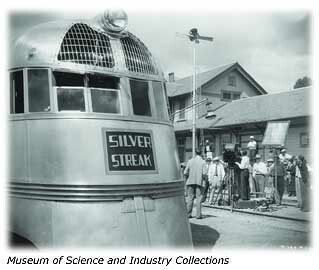 Both the screenplay and the video of the RKO "The Silver Streak" can be studied in the archives of Knox College's Seymour Library.